Jerk's Island Grill, Covington, La. 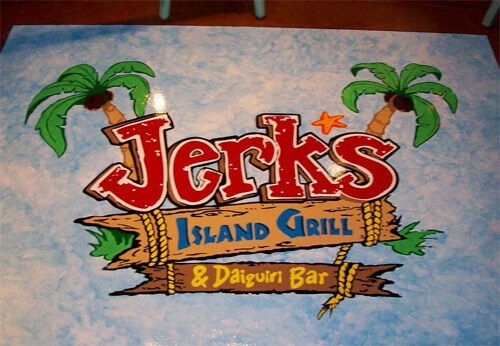 Contractor: Bomanite of New Orleans Inc.
What started as merely a floor stain job quickly turned into a four-part project when Earl Mylie of Bomanite of New Orleans, located in St. Rose, La., got to work at Jerk's Island Grill, which opened on Jan. 26 in Covington, La. After applying a chemical stain in a terra cotta and amber color to the Caribbean-theme restaurant's floor, Mylie and his crew completed a stamping project outside of the restaurant, a bar showcasing embedded tropical paraphernalia such as seashells and bottle caps, and a 5-by-7 floor logo at the restaurant's entrance, all within a one-month period. General contractor Cal Lemoine of Lemoine Family Builders recommended Bomanite of New Orleans to the owners of Jerk's Island Grill, and after a bid for a floor stain was accepted, Lemoine and the restaurant's owners discovered the decorative concrete company could do much more. Stamped tiles in gray, cream and green cover the sidewalk outside the restaurant in an ashlar slate pattern, creating "a New Orleans look that you'll find throughout the French Quarter," Mylie says. For the bar top, island-theme items - bottle caps, drink stirrers, postcards, seashells and coasters - were glued to the bar's pine surface and covered with approximately 15 gallons of Envirotex Lite, a transparent, reactive polymer compound that cures to a thick, glossy coating. Finally, a custom Flattoo vinyl stencil from Surface Gel Tek depicting the restaurant's name among palm trees and broken wood planks was placed on the floor atop coatings of moisture-barrier epoxy and primer, then enhanced with hand-painted details and sealed with a urethane coating. Using a moisture barrier product was crucial to the logo's durability, Mylie says, as the floor endures a ton of foot traffic. "It's subject to the most abuse." Creating the bar presented the biggest challenges. Mylie says he experimented with different types of glue to hold down the items. Some of them, such as the shells and bottle caps, couldn't be glued at all and were instead set in place while the product was carefully poured. Bubbles forming around the knickknacks were a concern, and Mylie says workers had to pour twice as the product didn't harden properly the first time. "It was a lengthy process," Mylie says. "On the first go-around there were dewy spots, so we stripped it and started over." After a month of solid work, Jerk's Island Grill ended up with durable dÃ©cor that transports guests to a tropical island as they walk through the restaurant's doors. "We wanted to brand our product, so we came up with a floor design that makes us immediately identifiable when people walk in," Jerk's Island Grill co-owner Greg Fay says. "With the bar, we wanted to create a fun atmosphere, so we brought in items, all with a fun, laid-back Caribbean theme that we inlayed in the bar. It became a story board." Walk into Dewz Restaurant in Modesto, Calif., and your eyes will immediately land on the lush, glossy, reflective red hue found on the bar and tabletops. The inspiration for the rich color was Judy Aspesi, the restaurant's owner and a Modesto fixture, according to Flying Turtle Cast Concrete's Mat Rogers, who is also based in Modesto. "Judy is very done up - she's the lipstick queen of the town," Rogers says. "She has a real passion for food and entertaining." After Rogers was recommended to Aspesi by her designer, Chris Johnson, Rogers got to work on a curved concrete bar top and several concrete tabletops, which were completed and installed in early 2009. Rogers viewed fabric swatches selected by Johnson for the restaurant's dÃ©cor before developing the spotlight-stealing crimson color. The concrete bar top compliments the bar's blue backlights and a black square tile design that covers the walls, while the concrete tabletops have been put to use in a lounge area where guests can sip drinks while waiting for their tables. "The color is the outstanding feature on this project," Rogers says. "It's not just one color - it goes from a magenta to a persimmon. There's depth to the color and brilliancy to the finish. The beauty of the color is what gives it the wow factor." Working within a four-week timeline, Rogers and about seven Flying Turtle Cast Concrete workers first cast pieces using a two-pour, glass-fiber reinforced concrete (GFRC) system. Rogers says to achieve a look of brilliance, he used white cement and aggregate in the casting process. To create the one-of-a-kind color, Rogers used pigments in red and blue from B&J Colorants, plus an alcohol-based aniline dye in bright orange. The pieces were then topped with two to three layers of a urethane sealant and a waterborne epoxy spray. "We're known for using sealers that bring out depth of color, and we achieved that with several layers of a thin urethane sealer that penetrates the surface," Rogers says. And since these surfaces endure a ton of abuse - be it from beer bottles, plates or guests' rings and watches - Rogers made sure to choose a strong product for the final layer of the bar and tabletops. "We chose that epoxy because it's tough and easy to repair," he says. Aspesi says Rogers' work has not only endured the test of time, but has beautified her restaurant as well. "I had heard the material was really durable, and it has been fantastic," she says. "People will sit and eat there, and the surface doesn't stain and it hasn't chipped. It gets a lot of abuse and it's held up well. People look at it and can't believe it's concrete. Mat gets a lot of work from people who come in here." Joey's Smokin' BBQ, San Diego, Calif.
Flames and home-style barbecue parties served as the inspiration for the floor stain and marble bar top at the Joey's Smokin' BBQ in downtown San Diego, the sixth location for the popular chain owned by restaurateur Joey Maggiore. Using products from Concrete Solutions, Tony House of Upland, Calif.-based TH Designs and several of his workers transformed an old terrazzo floor into a glossy, warm red and gold surface and built a jagged-edged cream and gray bar top for the Memphis-style barbecue eatery in July 2009. "For the floor, we wanted something that was fiery-looking, and I think we achieved that," House says. "And the bar looks kind of worn - it has an outdoor stone effect. It's reminiscent of having a barbecue outside at home." Maggiore met House through a general contractor who had done work for Maggiore in the past, and after House presented floor and concrete countertop sample work to Maggiore, he was hired for the Joey's job. 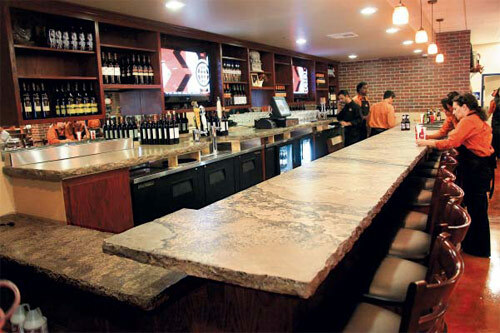 The 25-by-2 1/2 bar top was formed in three pieces in House's shop using Concrete Solutions' Ashby System, a concrete countertop system that results in a natural stone or granite look with a matte finish. "It's done like any other concrete countertop, and it's a very popular, unique system," House says. The completed bar top was then installed, giving the restaurant an "urban barbecue feel," according to Maggiore. "With the broken edges, colors and cracks, it makes it look like an old, rustic place," he says. For the restaurant's floor, slip resistance was as much of a factor as color vibrancy was. House and his workers began by applying a concrete resurfacing product, followed by a dye stain in Concrete Solutions' Canyon Gold and Sunset Red. Next, to seal the floor, they applied Concrete Solutions' water-based clear epoxy and clear HP urethane sealer. They finished with a coat of water-based urethane gloss to add sheen. "The floor finish isn't slippery, although it has a nice gloss to it," House says. "Your feet will get a little greasy walking in and out of the kitchen, but the products on the floor allow your feet to grip onto it a little bit." To help keep the floor grease-free, House provided the restaurant with a Concrete Solutions floor cleaner for easy upkeep. "Slip resistance was a huge factor for the floor," Maggiore says. "So was maintenance - we wanted it to be easy to maintain and we didn't want it to lose its sheen." And knowing that the bar top would be subject to abuse, Maggiore felt going with a rugged surface would make a few nicks and scratches seem like no big deal. "On the bar you have glasses pounding, and we wanted it so if it chipped, it would still look natural," he says. Mandarin Lounge, St. Louis, Mo. 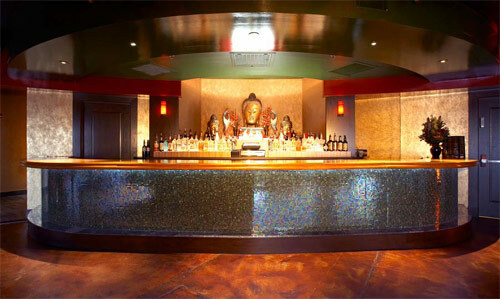 Back in 2007, Pete Ferretti and Buddy Coy were in search of a top-notch decorative concrete contractor to create a custom-designed bar and bathroom sink for their new high-end, sultry, Asian-themed St. Louis nightclub, Mandarin Lounge. After conducting some online research, they found Chris Klipfel of St. Louis' CK Concrete Design. Now, a shimmering gold bar serves as a backdrop to nights of clubbing at the lounge, and a "his and hers" cascading waterfall sink bridges the men's and women's bathrooms at the party spot. "Vegas nightlife was a driving force behind the design," Klipfel says, adding that the look of Palms Hotel and Casino's Little Buddha restaurant was especially influential. "The owners loved Asian concepts, blood red and gold - they were very into that." 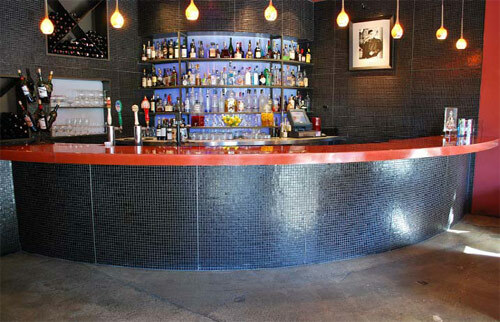 Using glass-fiber reinforced concrete (GFRC) in a yellow color, Klipfel cast the bar top on a melamine board surface. To form the bar's custom, double roll-shape edge, he used flexible drainpipes as a mold. After 16 hours of curing, Klipfel performed a five-minute acid wash at 100 percent concentration, which toned down the bright yellow color and resulted in an aged look. He finished with a polyaspartic polyurea sealer. "We did a light and fast acid wash to bring out the irregularities in the casting," Klipfel says. "It starts knocking down to rusty, burnt hues and has an aged effect. A lot of Asian things are aged, old and stand the test of time." To create the "peekaboo" sink (the design allows men and women to see through into the opposite bathroom while washing up), Klipfel ordered a custom-made acrylic skylight in the shape of a sink to cast on. He formed a sloped, receding sink edge using a mold of plywood and plexiglass to create a smooth casting surface. He cast the sink using GFRC and gave it a traditional acid wash in a rust color, followed by a polyaspartic polyurea sealer. Mandarin Lounge owners brought in New York City-based designer Scott Kester to design the sink. Co-owner Pete Ferretti says it creates a focal point in the bathrooms. "We always try to do one thing that stands out, and we had the opportunity to do that in our bathrooms because we had the space," Ferretti says. Durability was a factor in the choices of materials used for the project, especially the bar. Klipfel says he chose GFRC and a polyaspartic polyurea sealer for their strength, and so far, he's only had to reseal the bar top once. "You'd be surprised at the amount of abuse people inflict on the bar," he says. Klipfel adds the project's biggest challenge was physically moving the pieces into the lounge. "The restaurant space is on the second floor of the building, and it has one small, six-person elevator," he says. "We had to rent a crane, shut down the street, and lift the bar and sink up onto the second-floor patio. It was kind of scary to see thousands of dollars worth of concrete being lifted up into the air."